Every year, hard-working skiers find that they have been the victims of a ski chalet scam, and that their dream chalet holiday has gone up in smoke. At Chamonix All Year, not a season goes by where we aren’t contacted by distraught holiday-makers who have been conned out of a booked ski chalet. You don’t want to find out you’ve been scammed with only weeks to go, and all the best chalets already fully booked. Or worse, to turn up in resort and see that someone else has checked into that chalet you booked and paid for months ago. So if you feel that something just isn’t quite right, follow the steps below and check out your gut feeling before parting with your money, to give you peace of mind. Thanks to our 15 years of experience in Chamonix, we have put together a top ten of tips to help you stay safe online when booking your ski holiday, and to avoid disappointment. Download and share our visual guide, which you can see at the bottom of this page, to spread the word and stop your friends falling victim to chalet fraud. If you’re short on time, scroll down to the conclusion for our “too long, didn’t read (TL;DR)” summary! 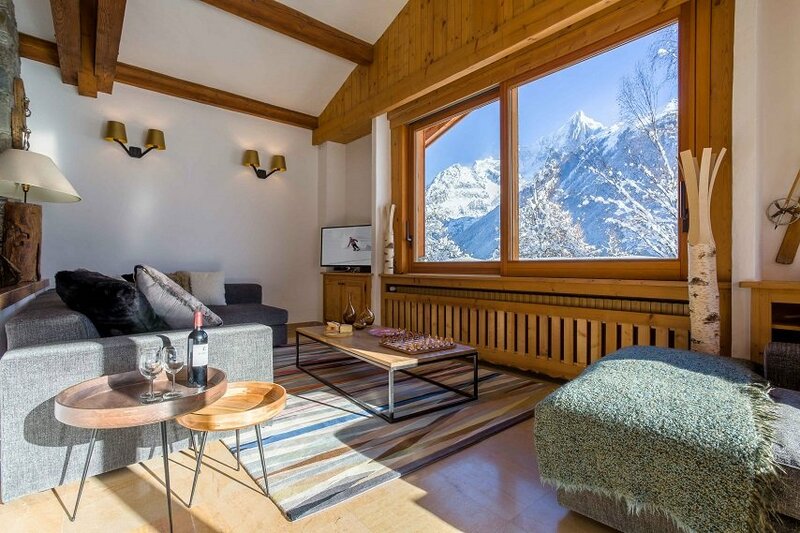 All the chalets featured in images on this page are genuine chalets which can be booked legitimately on the Chamonix All Year website, on the owners’ own websites or on other booking platforms. It’s important to know that if you pay by bank transfer, there is no protection offered in the event that your payment turns out to have been sent to a chalet scam outfit. Once the money is in the recipient’s bank account, your bank cannot get it back. Usually, scammers will take the money straight out when it arrives, making it impossible to recall. By contrast, paying by credit card gives you protection from the card company. For example, in the UK you will be protected by Section 75 of the 1974 Consumer Credit Act, up to £30,000. Not only that, but to set up card payment systems, companies have to go through strict vetting processes to prove that they are legitimate. Some chalet companies may offer bank transfers as one of several payment methods available, which is normal practice. However, it should definitely raise a red flag for you if a chalet agency doesn’t offer a credit card payment option. Bear in mind that some individual chalet owners may not be comfortable with card payment technology, or may want to keep control over their cash flow. Other reasons that card payments might not be possible would be if the chalet owners’ operation is not big enough to justify the associated costs, or that they want to avoid passing these charges on to their clients. If all the other items on this list check out and you have been reassured by your contact with the chalet manager or owner, then you may feel comfortable to make the bank transfer, while still proceeding with usual caution. In any case, you should never be asked to pay by wiring money via a service such as Western Union. 2. Is their social media legit? How long is the history of the social media accounts of the website, like Facebook, Twitter or Instagram? They should be at least a year old and, if they are not for one of the large tour operators, should not have thousands of likes and shares. Have a look and decide, do the posts and comments look natural to you? The chalet company website is also a rich source of clues as to whether you’re dealing with a good, reputable company or owner. Have a good look around their website. Well-established companies will usually have a blog full of useful local information which goes back several years. There are also a few more technical things that you can look into. Fraudulent websites usually copy photos and text directly from genuine chalet companies’ websites. You can check if this is the case by running a few tests. Right-click on an image of the chalet, then click “Search Google for image”. The search results should show the website you’re looking at. If this function to search in Google has been disabled, be suspicious and tread with caution. To prevent you from realising that the text has been copied from another site, fraudulent websites will also disable the option to select text on the page. Check if you can drag your mouse to highlight some of the text or not. We also recommend that you look for a website which has live availability. Don’t waste time with provisional bookings while middle-men check if your dream holiday has been snatched from under your nose. Choose a site where you can book and get an instant confirmation once your other research has checked out. Genuine chalet owners and companies will start receiving bookings for the peak weeks of the winter (Christmas, New Year and February half term) up to 12 months in advance. If the chalet you’re looking at has an empty calendar for the winter, that should ring alarm bells for you. Exceptions to this would be a chalet which is new to the market – maybe it is newly built, or recently renovated, or maybe it has a new owner who has decided to rent it for the first time. If you see an empty calendar, then contact the company to find out more (see number 6 below). Past reviews and comments from guests are a valuable way of checking out an owner’s or a company’s reputation. Text testimonials on a website can easily be faked, so look for websites that use an independent review service, or companies which have testimonials on services such as TripAdvisor, AirBnB and HomeAway too. Don’t keep all your communication by email. Follow up with a phone call to a landline, to ask more specific questions about the accommodation you’re hoping to book and query anything that’s making you uncomfortable. The contact details for your chalet, including an email address and phone number, should be easy to find on their website so you can get in touch. Your chalet contact should be an expert in the property that you’re booking, as well as in the ski resort, so feel free to ask questions like “how far is the chalet from the slopes or the shops?”. If the person you’re speaking to can’t answer your questions with helpful, informative answers, listen to the warning bells. Be suspicious of businesses that will only communicate via email and mobile phones. Don’t be too shy to ask! If you’re stuck deciding between two or three ski chalets, then ring up for some advice from the people who should know them best. Discuss with them the pros and cons of each option so you can find the best one to suit your group. Many reputable companies will use services such as Google Ads to promote their business. However, if you can’t see the website you’re looking for below the adverts in the “organic” search results as well, this may be a sign that the website has been very recently set up and doesn’t have a good history / ranking in the search engines. Similarly, if you search for a company name and the first paid results don’t have that company’s name in the URL, they may be chalet scam websites. In the same search, check if they have a Google Business listing on the right-hand side of the page. All reputable companies will have made sure this is set up in order to provide their guests with reassurance, and these listings have to be verified by a postcard sent to the business address before they can go live. Don’t trust listings on AirBnB / Booking.com etc. which try to redirect you away from the platform, encouraging you to pay by bank transfer. If you are booking a property on one of these booking platforms then make sure you follow their payment policies in order to ensure you are covered by their protection and guarantees. Contact the local tourist office and ask whether they have heard of the owner or company that you are dealing with. Well-established companies will have made the effort to build a relationship with their local tourist office, who should be able to vouch for them. Some websites will also try to build your trust by showing recognised industry badges e.g. ABTA or ATOL. Anyone can copy and paste this onto their site, so check on the websites for these associations to see if the website you’re looking at is a registered member. Bear in mind that many individual owners and small- to medium-scale operators don’t need ABTA or ATOL licences. However, they should be able to reassure you on the phone that you’re in good hands, especially if the other points in this list check out. Do they offer another protection scheme instead? 10. Does it seem too good to be true? If the chalet has plenty of bookings, but availability for a peak week left at the last minute, that might set off the alarm bells. Ring up and ask for more information about why that is the case. It might be a new chalet to the rental market or there might have been a last minute cancellation, but the person you’re speaking to on the phone should be able to reassure you. Similarly, if the price seems surprisingly low for the standard of the chalet you’re looking at or for the week that you’ll be travelling, then ask yourself why. It might sound like you need a Private Investigator’s licence to get to the bottom of whether or not your chalet listing is the real McCoy or not. But don’t forget that booking big chalets and peak weeks can involve parting with large amounts of money, so it really is worth checking – and double checking – before you commit. Hopefully, by doing some or all of the checks above, you’ll end up booking with a company or chalet owner with a great reputation, who will be able to show you the best of their resort and give you a holiday to remember. And once you’ve booked, keep in touch! The best chalet companies will be happy to help you organise the details for your stay as it approaches. If those ten tips have left you wanting more, there are other things you can also check out when deciding who to book your ski holiday with. Follow this advice and avoid the trap of yet another chalet scam. Find a local specialist. Provided that they are vouched for by the local tourist office and you know they’re not a chalet scam, you’re likely to get a more personalised experience. Local specialists know the resort better than big agencies or tour operators, and will be able to give you the best tips to make the most of your ski holiday. They will also be on-hand during your stay in case you need advice or assistance. Local specialists will also have had the time to cultivate great relationships in-resort, meaning their guests are usually first in line for the best deals, with discounts on everything from ski passes to ski hire and airport transfers. Trust a company that has industry recognition. You can be sure that an owner or chalet company with awards or nominations to their name has been carefully vetted by some of the biggest and best in the industry. Avoid companies who charge a lot for hidden extras. Most decent chalet owners or companies will make sure the price is as transparent as it can be for you, so the accommodation price you see should include linen, tourist tax, cleaning and bills (electricity, wifi etc.). For more reading about how to avoid ski chalet scams this winter, visit the websites of these industry experts WeLove2Ski and or our friends in Samoëns, Alps Accommodation. If you’re looking for a trustworthy chalet company to book with this winter, look no further than Chamonix All Year. Call and speak to our Sales Team today on +44 (0) 203 384 1801, or email them at info@chamonixallyear.com. You can also browse all our self-catered chalets in Chamonix.